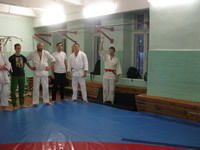 ﻿ What are the rules of behavior at Aikido training? 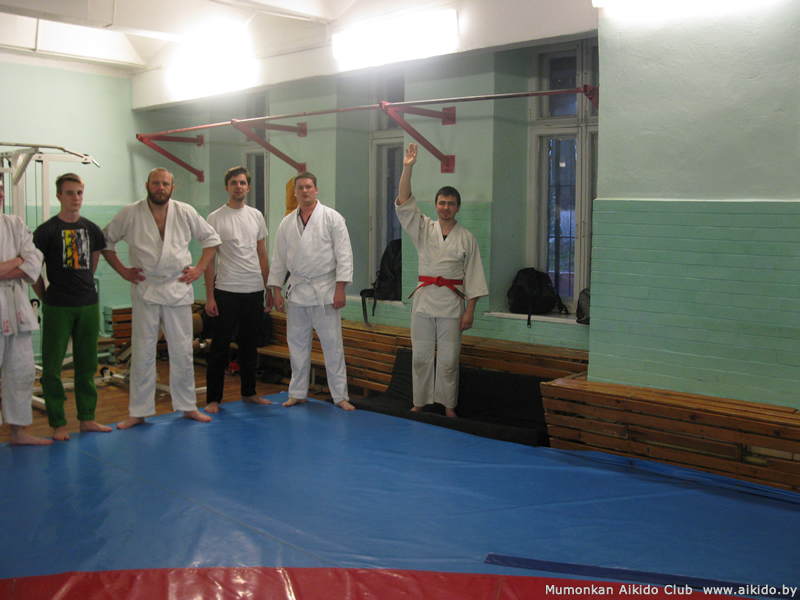 Home » Questions about Aikido » What are the rules of behavior in the dojo and Aikido training? In Japanese society there are a lot of mandatory or recommended rules, rituals and ceremonies to observe. Practically all spheres of life in Japan are steeped in traditions. It is especially evident in communications between people. Aikido, as a Japanese martial art, is not an exception. 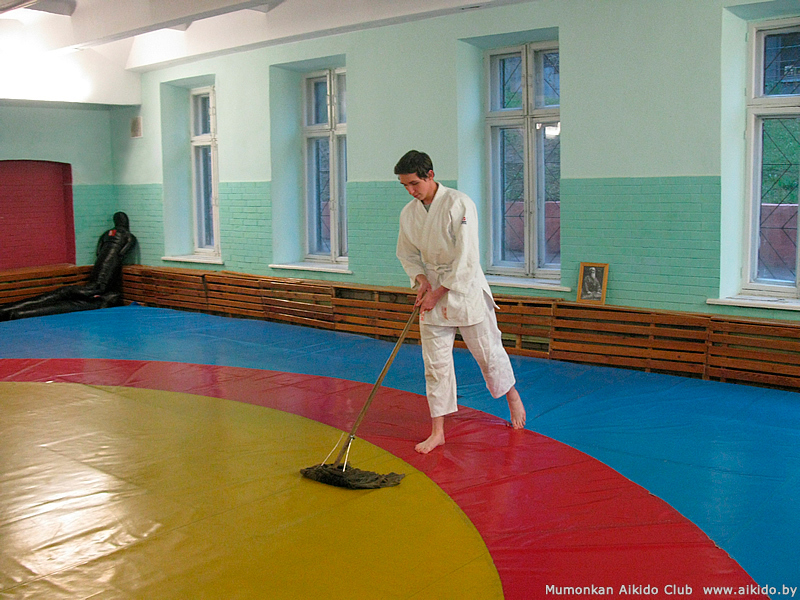 There are several mandatory rules in Aikido which may seem somehow unusual for Europeans, but nevertheless they are necessary to observe at trainings. Entering and leaving the dojo, it is necessary to bow. Aikido is a long and not an easy Way. With this bow you pay a tribute of respect to the place where you penetrate into the secrets of this martial art. Food, smoking, and gum chewing are forbidden at trainings. You may drink mineral water. However, you must remember that drinking water during exercise lessens your current endurance. Therefore, we recommend drinking water only before or after but not during exercise. Be patient! Before the training starts it is necessary for you to prepare yourself. 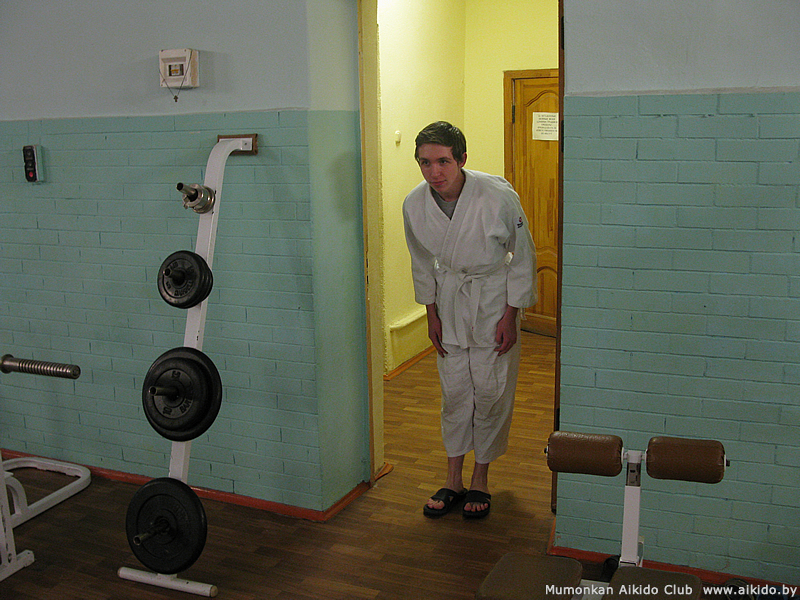 For this purpose you should come to the dojo in advance (10-15 minutes earlier), to get well warmed-up. In this case, the probability of getting injured at the training decreases sharply. 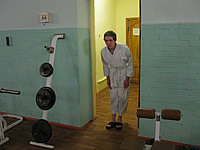 It is clear that in aikido it is necessary to learn aikido techniques and perform effectively with "cold" or unprepared muscles. But if you are a beginner and have not reached a certain skill level, it is better not to experiment. Take a few minutes for general physical exercise. Collisions, rivalry, arguments and abuse are forbidden at trainings. Remember, in the hall you are surrounded not by enemies, but by partners. You learn from each other, you teach each other, so be tolerant to others. If you are late for training, you are not allowed to walk onto the tatami; you should wait for permission of the sensei to join the group. Raise your hand to draw his attention. Pranks and mischief are absolutely forbidden at trainings. Aikido is a martial art and with the techniques learned you can easily hurt your partner or cause injury to him/her. All the talks at the aikido training should be minimized. So if you have come to the dojo try to leave all routine problems behind its walls at least for 2 hours. Talking on a cell phone is forbidden at the trainings. If you have some extremely urgent matter, ask the permission of the sensei and then make your call having left the tatami. Do not argue about techniques with other trainees. 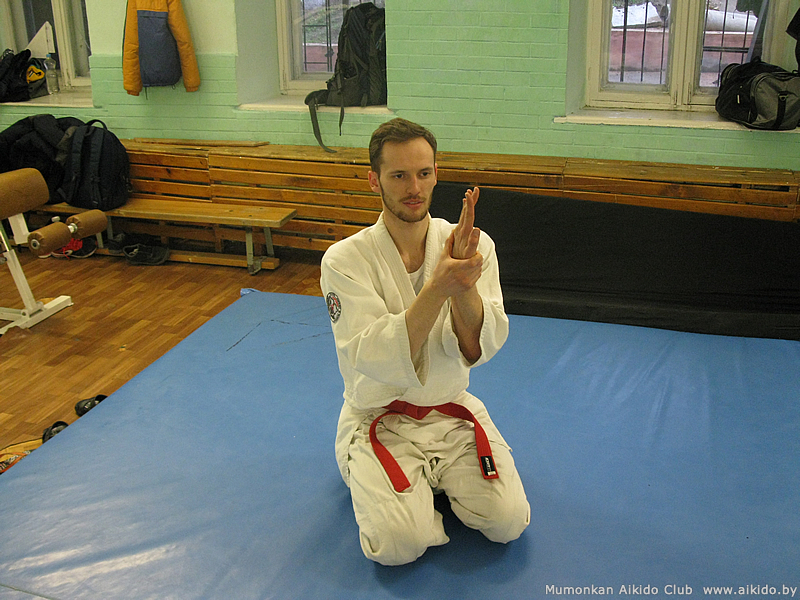 At training there is only one correct opinion – the opinion of the sensei. Approach him and ask if you have understood the task correctly. Do not impose your ideas about Aikido on other trainees. Everyone comes to the dojo with his own goals and objectives which do not necessarily coincide with yours. You are not to correct or instruct your partner or other trainees if you have not reached the level of an instructor, senior pupil (sempai) or were not allowed to do so by the sensei. When the sensei shows techniques which you are going to study, you should watch him attentively. It is forbidden to talk or walk when the sensei explains something or demonstrates techniques. Besides you are neither allowed to lie on the tatami, nor to sit on it with your legs extended, or to sit leaning on something. Your posture should express respect and attention. Receiving personal instructions at training watch the sensei closely. Bow to him when he finishes. Your bow is a sign of gratitude for the attention you were paid to. If it is necessary for you to ask sensei a question, you must not call him up; approach him yourself and wait until he is ready to listen to you, bow to him and only after that ask him a question. 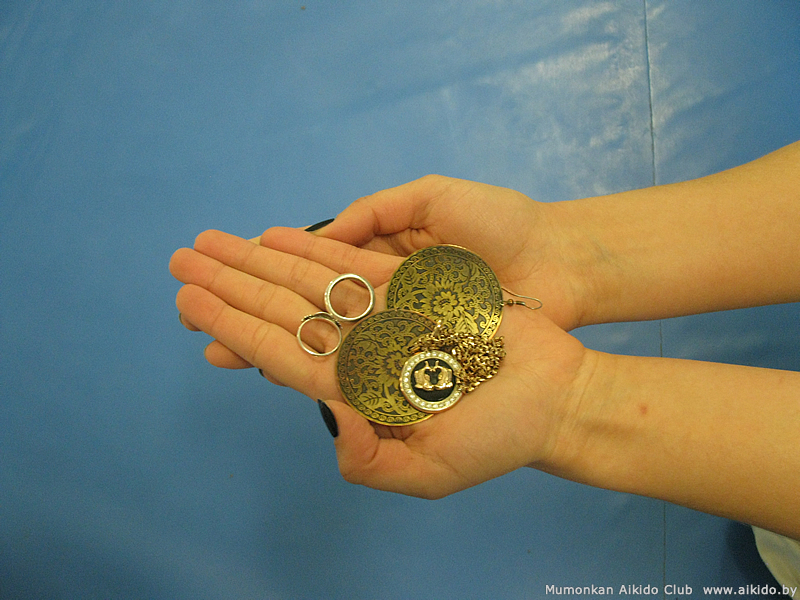 During the aikido trainings you should not wear any jewelry. You should remove earrings, chains, rings and other jewelry that may cause injury to you or your partner. You should not leave the dojo without permission of the sensei. If it is necessary for you to leave urgently, approach the sensei and ask his permission. If the sensei forbids you to leave, you are obliged to return to your place and to continue training. Do not wander around the dojo and do not sit on the tatami doing nothing. This space is meant for those who want to train. 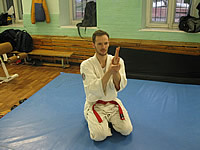 Health restrictions for Aikido practicing.